This recipe, like Eggs Benedict, is constantly being bastardised. Eggs Florentine, or more correctly, Oeufs poches florentine, is a creation of Auguste Escoffier, the father of modern French cuisine. It does not use hollandaise sauce, but bechamel sauce to coat the poached eggs. Escoffier did his Eggs Florentine as a sort of communal dish, containing up to 8 poached eggs. I think everybody nowadays would prefer their Eggs Florentine served in individual ramekins, or perhaps two poached eggs in cocotte dishes. The quantities here are Escoffier’s and, are very vague as all his receipts (yes, receipts) are. Preheat the griller to hot. Arrange the eggs on top of the spinach. These can be eggs poached in advance and reheated just before using. Add 1 or 2 egg yolks to the standard bechamel sauce to prevent it turning under the griller, then coat the reheated and well-drained eggs with the sauce. Sprinkle with grated cheese, add a little melted butter and brown lightly under the griller before serving. 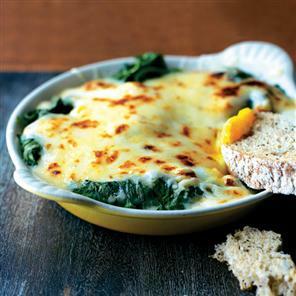 Serves 3 – 4 in cocotte dishes, 6 – 8 in ramekins.